And so it begins again. What a fitting time to start a new book than springtime? EAT & DRINK book 4- with a focus on spring, some thoughts on summer and some past reminders of winter. I've created a rough draft list of recipes that I have already started to test. It's a challenge to think about favas and fresh spring onions when snow is in the forecast. 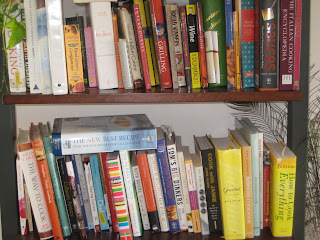 Gourmet cooking magazines, my wall of cookbooks, food blogs and farmer's markets all help to inspire me to rethink an artichoke or try a new twist on lamb. The HerbFarm garden I know will inspire me to think differently about certain vegetables and of course, challenge me to go beyond my comfort zone limit with flavors. Since it is a recipe and local wine pairing book, I often think about common flavors in wine and try to pull those flavors out of food using different combinations of ingredients. For instance, one recipe I'm excited about is ham wrapped prawns with a chorizo apricot butter. The sweetness of the apricot and prawns should draw out some great flavors in a crisp Washington Riesling or perhaps complement well with a seafood-loving sauvingnon blanc. The real trick when writing these recipes is trying to balance my cravings for my taste preferences while at the same time keeping things in perspective with my cooking audience's taste buds. Not that I am that extreme, I just know that most people are pickier than I am, and many home cooks like to dip their toes in the water instead of plunging in. Plus, I find the most successful recipe collections offer a little something for everyone; something for the novice, something for the gourmand and probably something that just makes you say, "oh interesting." Most of all, I want to inspire people who enjoy cooking to go out into the farmer's markets and check out what's fresh and dabble in the kitchen with some lovely, local ingredients! Is there anything better then sitting around with friends over some great wine, chatting about life and goals and making great delicious memories?